On March 23, 2018, unbeknownst to most Americans, the course of U.S. history was forever changed by irresponsible government leaders from both parties. On that fateful day, the massive $1.3 trillion, 2,232-page omnibus spending bill (which no one even took the time to read) tossed financial sanity out the window. The consequences will soon impact the lives of every man, woman and child for many decades to come. Such profligate government spending impacts the younger generations especially hard, as they are buried alive under this massive future debt; which already amounts to $160,000 for every household in the nation. Imagine handing your child a credit card maxed out at $160,000 in debt and expecting them to make the payments! Career politicians seem to believe debt and deficits don't really matter; but I say they matter a lot, on both governmental and household levels. Spendthrift leadership breeds spendthrift consumers. “Spending on U.S. general purpose credit cards surged 9.4 percent last year, to $3.5 trillion,” according to industry newsletter Nilson Report. Credit card delinquencies are also rising. U.S. household debt climbed in 2017 at the fastest pace since 2007 – and this is during a supposed economic recovery! 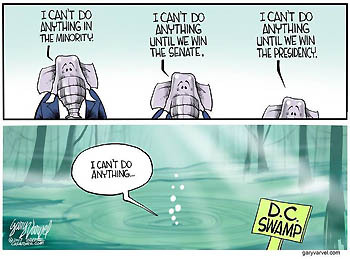 President Trump campaigned on the promise to “drain the swamp” in Washington DC but instead it appears the swamp is rising; thereby draining Trump's political promises of fiscal responsibility. No wonder so many big time investors, like Microsoft founder Bill Gates, Hedge fund manager Ray Dalio, and JP Morgan co-president Daniel Pinto are calling for a big drop in the stock market sometime soon. Sadly, we never seem to learn the lessons of market crashes in the past, so we must repeat them. The way I see it, our leaders will soon face two options to bring the U.S. and world economy back into balance, a huge increase in consumer inflation - as the Fed struggles to reflate the economy – or, investors will face a major drop in asset values. Neither one will be neat or pretty. And we can’t rule out both! Add to this risky equation the millions of Americans facing an uncertain retirement in the next decade as 10,000 baby boomers a day turn 65. The biggest problem is that less than 30% have saved enough money to maintain their lifestyle - and Social Security and Medicare funding is becoming a bigger burden every day. Yes, America’s future is at risk in many ways but making a few, simple adjustments in your financial portfolio today can help you safely weather the coming financial storm. The wisdom of asset diversification has been proven over and over again. Common sense says to sell highly-priced assets, like stocks, to buy more reasonably-priced assets, such as physical gold and silver.